Next thing ticked off my list - maternity clothing for my island sims. 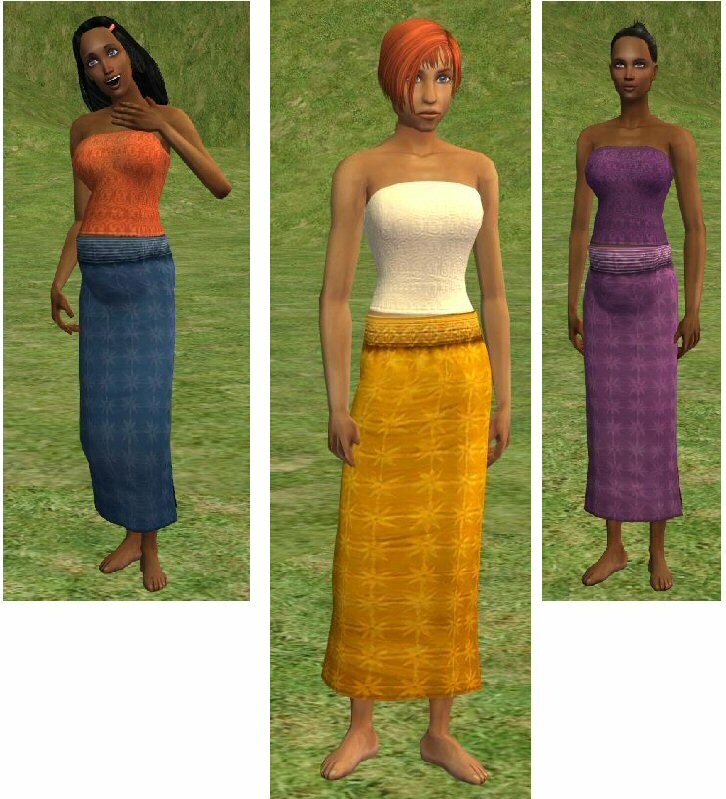 Most of my islander clothes don't have pregmorphs - do you know how silly sims look, walking around like they're nine months' pregnant, but with no belly? and the default outfits looked really wrong. Rather than learn how to add pregmorphs to all those other clothes, I decided a general default replacement would be simpler. 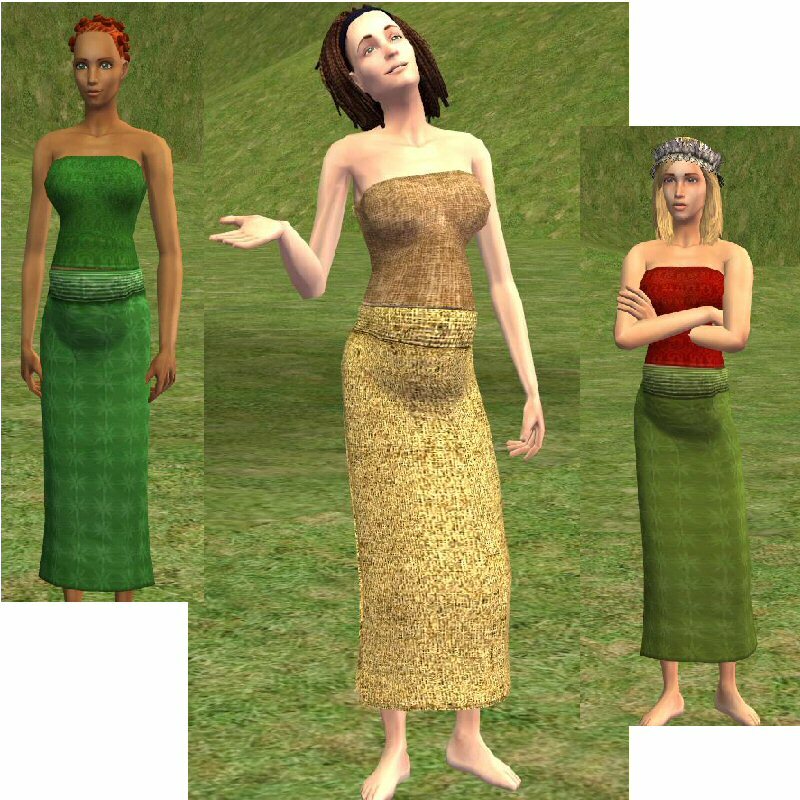 I have used the BV huladress mesh, maternity-enabled by The Mystical One, to replace the default maternity clothing. The mesh has larger breasts and belly than the Maxis standard. I've made nine recolours. With this package in, all pregnant women in your game will wear one of these outfits. If you're sick of them, take the package out. Maternity clothing is randomly assigned to each pregnant sim, so I can't guarantee which one you'll see. The accessories from the original dress are not included in this package - belt, lei and grassy bits are all removed. This will conflict with any hack which allows pregnant sims to wear everyday clothing - those hacks force sims into casual wear, which rather defeats the idea of this package. You can force them into default maternity using a dresser, but they'll return to their casual clothing every time they shower (or change clothes for any reason). It's annoying, so it's best to use either default maternity, or preg-enabled everyday clothing. My package will also confict specifically with The Mystical One's afbodymaternityshirtpants replacement. You can, however, use The Mystical One's replacements for the other maternity defaults at the same time if you wish. 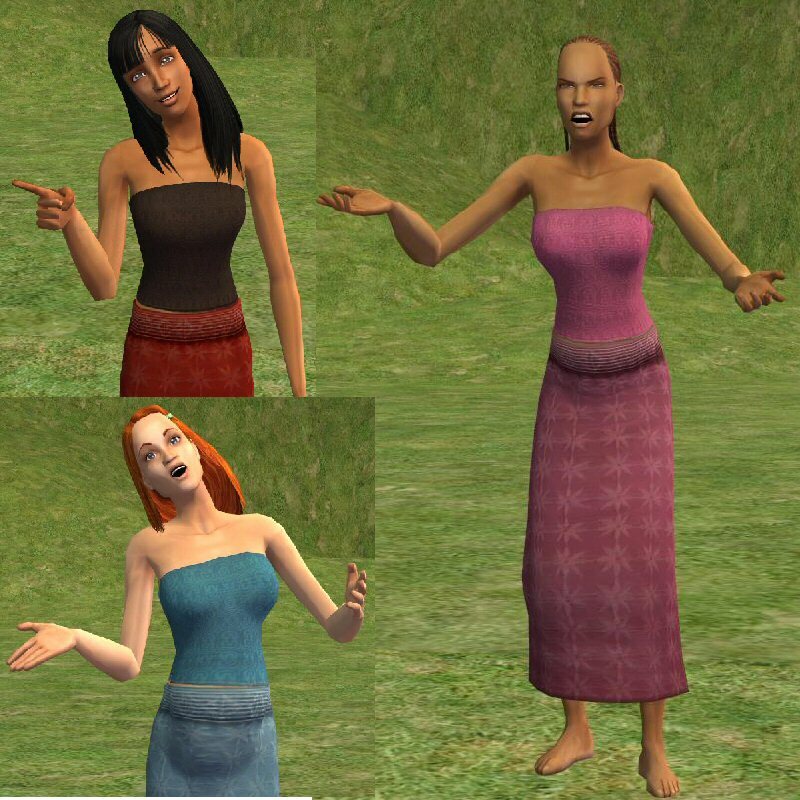 I'm using the rest of them myself, so my expectant sims have the larger belly in all states of dress or undress. And of course, you can only use one default replacement for maternity clothing at a time. 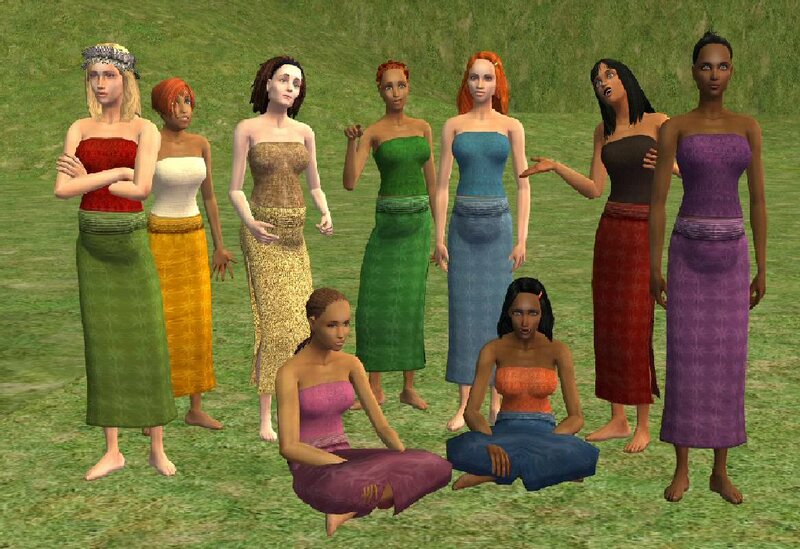 The mystical one's default sets (for all the Maxis clothing) are here: http://www.modthesims.info/download.php?t=237740. I've been using this replacement in my own game for a week. I believe it is trouble-free, but please report if there is something that needs fixing. Thanks to Phaenoh, HugeLunatic and BlooM, who have all helped me throughout the process. Without their input, I could not have done it. Thanks also to Numenor, whose AnyGameStarter makes testing easier. Thanks especially to The Mystical One, whose generous policy allows me to use his work as a base for mine. Saved me having to learn how to add a pregmorph, as well as how to replace defaults! 125 people have said thanks to aelflaed for this download.